The new build University Technical College (UTC) in Warrington will comprise a series of engineering and specialists workshops, a lecture theatre, science laboratories and general teaching spaces for up to 620 students and staff. The construction project is being powered via photovoltaic (PV) panels installed on the roof of the adjacent building – The Base – previously constructed by the same ISG team. 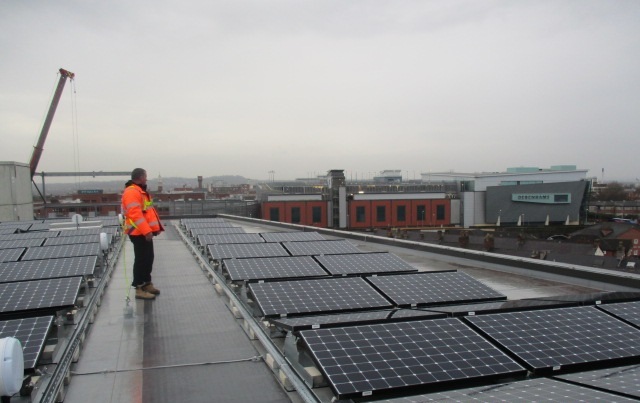 Site managers, Chris Maloney and Ben Pilkington, planned for the use of the renewable source and can evidence that the PV panels are supplying 100% of site energy, saving approximately two tonnes of CO2. Given the success of this initiative, the use of PV panels on temporary accommodation is being considered across ISG projects.